Approximately one and a half hours from Sydney, the Blue Mountains region is the most accessible World Heritage-listed wilderness area in Australia. This walk incorporates two of the most impressive Blue Mountains walks, which have always been popular since their construction in the early 1900s. On this 3-day getaway, you’ll descend the Giant Stairway and get close enough to touch the Three Sisters. There are descents through lushly forested areas to vantage points with close up views of waterfalls. Creeping vines, green moss and giant trees will be your constant companion, while hoping to catch a glimpse of the elusive Lyrebird. In Waterfall Valley, expect to see cascading falls with hanging swamps growing out of the cliffs. Hike into the depths of stunning canyons where forest giants tower overhead with the sounds of flowing water, birdsong and wind in the trees. Learn about the evocative blue haze that gives the mountains their name, as you hike through eucalyptus forest. Follow the Mid Cliff Walk to the 2-tiered Wentworth Falls, then it’s an invigorating trek to the top. The walk also traverses the national park between two delightful accommodations. Note that this Blue Mountains hike is also available as a self-guided 5 or 7-day itinerary. For further information on this trip watch this walk being featured on an episode of the Sydney Weekender in 2017. Start at Katoomba any time after 2pm. There is no walking scheduled for today but you can easily spend a few hours walking the well-marked cliff tracks or exploring the main street of Katoomba with its many boutique shops. Or if you get there early enough there is an optional Blue Mountains hike provided to Ruined Castle. The setting for the grand finale is the hike at Waterfall Valley. The route winds its way past waterfalls, beneath overhanging cliffs and through magnificent grottoes. A real highlight today is the mid-cliff walk along a wide path that has been carved into the sheer cliff face. Handrails, ladders and airy lookouts provide a birds-eye view over hundreds of miles of forests. Spray from spectacular Wentworth Falls refreshes weary walkers before climbing to the cliff top. The Blue Mountains hiking and walking tracks are very well graded and easy to negotiate. Full day walks average about 10 to 14 km with some ups and downs. 2 (or 3 if you get their early enough) of the most impressive Blue Mountains walks. The friendly locals we work with for accommodation, meals and transfers are attentive to your itinerary and eager to help make your departure and arrival each day as smooth as possible. The accommodation each night is in beautiful B&Bs that provide a welcoming and comfortable base to relax and recount the day’s highlights. All rooms have their own ensuite. The Blue Mountains is noted for its international cuisine with restaurants attracting some of the best chefs in the country. Award winning wines from the nearby Hunter Valley winery district add to the dining experience. The dinners are a la carte and set two course and the cooked breakfasts are generous. There’s an emphasis on local produce and wine from the region. Whilst you’re walking you’ll be provided with a substantial Walkers Lunch and get to eat it at a fabulous location on the track. A Walkers Lunch is varied and may include a high protein type salad, roll or a wrap, muesli bar, cake or muffin and a piece of fruit. Each day is slightly different with lunch always enhanced by Auswalk’s famous trail mix. 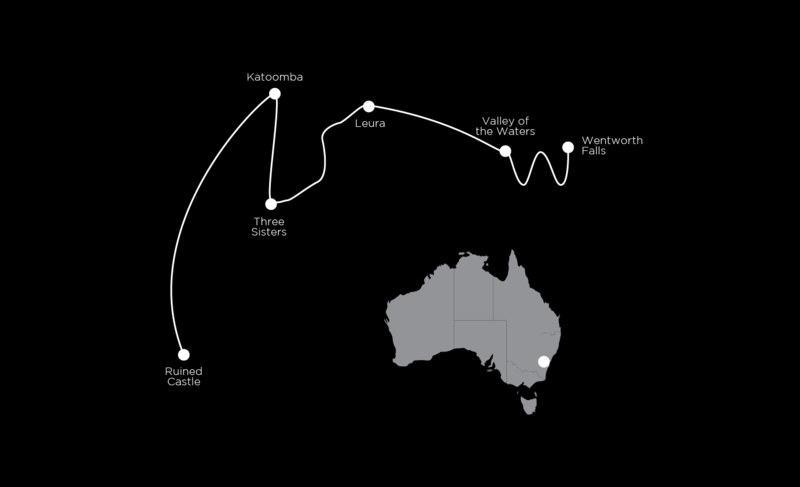 This walk starts and finishes in the Blue Mountains with a short two-hour train ride (not included in the trip cost) from Sydney to the first accommodation. The Blue Mountain walks are along well-marked tracks and trails, occasionally with steeper sections either ascending out of or descending into the gorges and valleys below. It’s a great combination of easy-going, moderate and more challenging walking terrain. Importantly, we walk in and out of accommodations and move you along the track in order to limit the travel time in a vehicle. Your luggage moves along with you seamlessly as you walk from one accommodation to the next with just your day pack. The comprehensive walk notes included provide lots of information on the flora, fauna, history and geology of the Blue Mountains. Available all year except July. October-November is usually mild to warm. Temperatures warm up from December-February. March-April is usually cool to mild. Temperatures drop from May onwards and the days are cool to cold but with little rain and good for walking. Warmer, spring weather returns around September.